Western blot analysis of whole cell lysates probed with CDC5L antibody followed by detection with HRP conjugated Goat anti Mouse IgG (1/10,000, STAR207P) and visualized on the ChemiDoc MP with 36 second exposure. Arrow points to CDC5L (molecular weight 107 kDa). CDC5L antibody recognizes CDC5L, also known as CEF1, PCD5RP or cell division cycle 5-like protein. 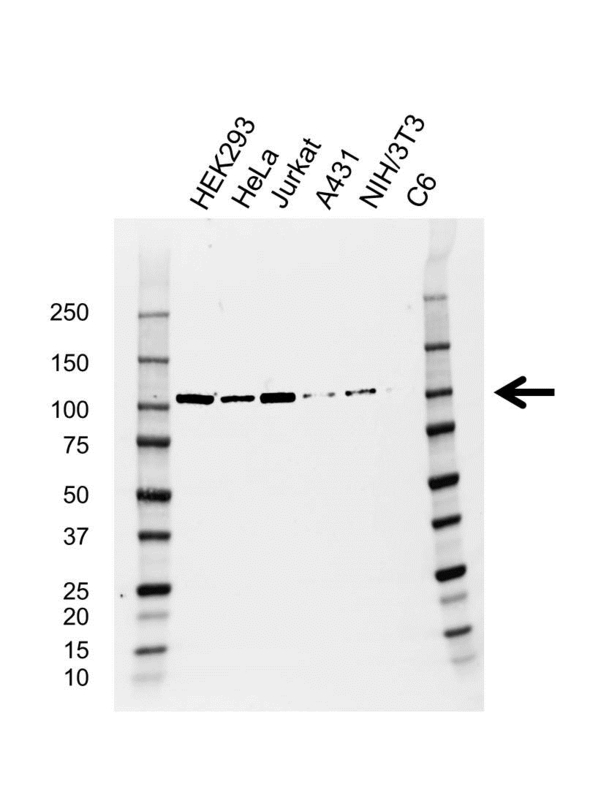 Mouse anti Human CDC5L antibody recognizes CDC5L, also known as CEF1, PCD5RP or cell division cycle 5-like protein. The protein encoded by this gene shares a significant similarity with Schizosaccharomyces pombe cdc5 gene product, which is a cell cycle regulator important for G2/M transition. This protein has been demonstrated to act as a positive regulator of cell cycle G2/M progression. It was also found to be an essential component of a non-snRNA spliceosome, which contains at least five additional protein factors and is required for the second catalytic step of pre-mRNA splicing (provided by RefSeq, Jul 2008). Mouse anti Human CDC5L antibody detects a band of 107 kDa. The antibody has been extensively validated for western blotting using whole cell lysates.